At the time of the founding of the nation, political democracy in the U.S. was extremely limited. The root meaning of ‘democracy’ is rule by and for the people. But exactly who is included in the term ‘the people’? The founding fathers lived in an era when only white male property owners governed and had rights. Thomas Jefferson declared “All men are created equal” when he wrote the Declaration of Independence, and yet its truth rang hollow for decades. It can be said that in our own times the phrase has evolved to encompass all people regardless of race, gender, national origin, or sexual orientation. And yet in practice, institutionalized racism enables profound social and economic injustice in this country. Although political democracy has improved over the decades, it’s not been due to the benevolence of the ruling class. The hard-won legal rights for women and African-Americans has required their prolonged and dedicated heroic struggles. And it’s an ongoing battle, especially with the recent ruling by the Supreme Court that overturned protections granted under The Voting Rights Act. In contrast to the expansion of voting rights to more people over the last century, the range of issues that voters can have some actual influence on has stagnated. For example, despite the fact that most Americans are in favor of Congressional re-authorization of the assault weapons ban, or advocate for lower prescription drug prices – legislative reform is blocked by Congress. Political influence by corporate lobbyists, special interest groups, and billionaire oligarchs rule the day. The will of the people plays second fiddle to the dictates of a minority of wealthy campaign benefactors. And as a result of the Supreme Court’s ruling for Citizen United in 2010, a new era of anonymous campaign contributions and unlimited bribery has been ushered in. The political right has been ingenious in figuring out how a minority party can rule America. And now they can claim all three branches of government. And yet, what is so obvious that it often goes unseen is the lack of influence that citizens have over fundamental economic decisions – the private sector’s production of goods and services. Under our system of monopolistic corporatism, real social power lies not within government but in the corporate economy. Crucial decisions that have a direct impact on society and the natural world are not up for a democratic vote. For example, the majority consensus has little say in which industrial products are manufactured (gas-guzzling cars as opposed to mass transportation), or how society is powered (fossil fuels or renewables), or how much and which consumer goods to produce (luxury goods for the rich as opposed to basic necessities to support the world’s poor). These important societal decisions are made by unelected corporate executives who are protected from accountability through that legal embodiment, the modern corporation. The workplace is less democratic than society as a whole. When the rights of workers go unprotected and union organizing has been banned, management and owners can turn authoritarian. Union-busting in this country has greatly reduced the number of union workers over the years. The activist courts continue to rule against organized labor in both the public and private sectors. Many non-union workers are forced to remain in their dead-end jobs rather than risk losing their health insurance and benefits. A full-scale economic democracy is simply incompatible with capitalism. Limiting the power of that legal construct – the corporation – would go a long way towards weakening the control that markets have over government and society. To begin with, legislating the removal of corporate money from politics could return our government to the people. Both political parties are beholden to campaign funds from Wall Street – and its getting worse. The special election in Georgia last year was the most expensive Congressional race in U.S. history. An obscene amount of funds was spent by the two parties along with outside money – a total of $57 million that resulted in a Republican win. Although Bernie Sanders showed us the way to remove big money from elections, the Democrat leadership didn’t learn a thing. 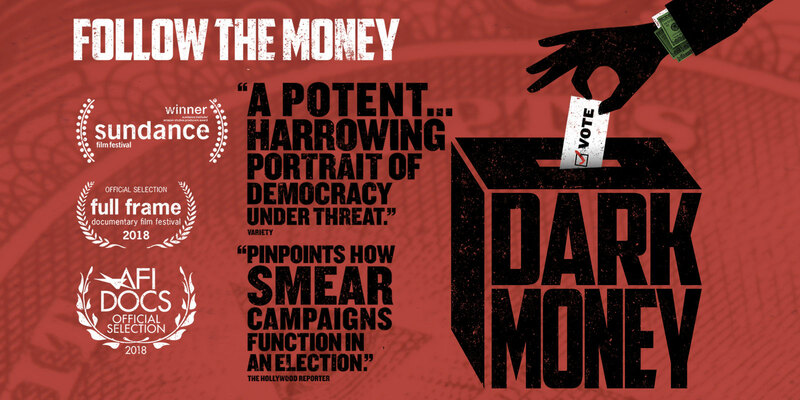 The new documentary Dark Money is an investigative probe into the corrupting influence of the shadow world of anonymous Super-PAC campaign funding. The film is not based on, but covers some of the same materials as Jane Mayer’s book of the same name. 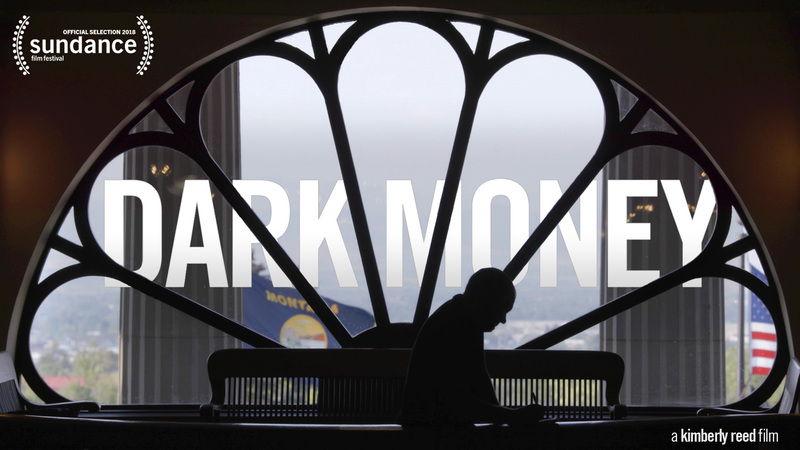 Dark Money shows at the Naro on Wed, August 8 with speakers and discussion. In Montana, corporations had been exploiting the state’s rich natural resources for more than a century, extracting minerals and strip-mining the land. State politicians and authorities were paid off by corporate interests to do their bidding, and the corruption reached into every level of government. When the mining operations were shuttered and the companies moved on, the state’s residents were left with toxic groundwater and a polluted landscape. Montana had learned the hard way, and subsequently enacted strict campaign finance legislation in the early twentieth century. State politicians adhered to these guidelines for decades. But that clean politicking began to unravel after the Citizens United ruling. An influx of corporate-funded smear campaigns and dubious legislation began to pollute the Big Sky state. Political attack ads would seemingly appear out of nowhere. Blatant propaganda and misinformation flooded the broadcast airwaves and people’s mailboxes. Sophisticated campaign marketing came from unknown organizations that claimed to be of grassroots origin but whose funding was unknown — and almost impossible to trace. The filmmaker enlisted the help of lawyers, campaign officials, and journalists to try to identify which out-of-state forces were behind the smear campaigns that would pop up at at key moments in elections cycles. One of the journalists that she follows in the film is Montana Free Press reporter John S. Adams. His diligence helps local authorities prevail in a relevant corruption case that ultimately brings down a prominent politician. Although the bulk of the Super-PAC money that has come into the red state of Montana has been used against Democrats, several mainstream Republicans have also been targeted. Perceived as too moderate or not willing enough to enact the legislative agenda of the Koch brothers and the corporate ALEC lobby, these incumbent Republicans were running in state party primaries against challengers who were more right-wing than they were. The battleground in Montana is but a microcosm of what’s going on across the country. The role that money plays in our politics has never been more corruptive. Dark money contributions increased a stunning 60-fold in the first election after Citizens United and funding for the 2018 campaigns has already far outpaced that of 2016. Dark money is getting more sophisticated, more insidious, and harder to track. And under the Trump administration, we can no longer count on the Federal Election Commission or the Supreme Court to derail the anti-democratic forces in our society. It’s clear that our nation is in trouble. Since Citizens United, anything goes where elections are concerned, and deception and lies rule the day. Campaign spending is the most fundamental political problem facing our democracy. There are organizations to connect with that can provide key information about campaign funding. FollowTheMoney.org which is based in Montana, and OpenSecrets.org collect and disseminate political contribution records for candidates in all 50 states. The investigative effort to make campaign funding transparent is the important first step in the battle for campaign finance reform. MAL VINCENT’S SUMMER CLASSICS For this 15th season at the Naro, Virginian-Pilot critic and columnist Mal Vincent has programmed a festival of notable films – including ‘Citizen Kane’ on Monday, Aug 13 – that he’ll introduce and embellish with personal stories about the Hollywood legends. Every Monday evening for 7 weeks through July and August. The director of ‘Of Gods and Men’ recounts a seldom-told chapter of WWI history concerning the role women played on the home front. Inspired by prize-winning French author Ernest Pérochon’s 1924 novel, director Xavier Beauvois’ emotionally devastating adaptation looks as gorgeous as any pastoral paintings of that era. The family’s matriarch (Nathalie Baye) must grapple with the farm’s workload while the men are fighting at the front. She reluctantly hires an outsider, a hard-scrabble teenage girl, to take on the difficult physical labor. In French with subtitles. Shows Tuesday, July 17. In this true story, small-town nurse (Catherine Keener) emerges as the reluctant leader of her working-class neighbors in their struggle to save their homes from political and corporate interests bent on seizing the land and handing it over to Pfizer Corporation. Their battle against the abuse of eminent domain goes all the way to the U.S. Supreme Court. Shows Wed, July 18. In 1880 Paris, 40 year-old sculptor Auguste Rodin (Vincent Lindon) finally receives his first state commission for ‘The Kiss’ and ‘The Thinker’, two of his most famous creations. Constantly working, he shares his life with his lifelong partner, Rose, and his mistress, the young Camille Claudel, the gifted student who becomes his assistant and a talented sculptor in her own right. In French with subtitles. Shows Tuesday, July 24. Three strangers are reunited by astonishing coincidence after being born identical triplets, separated at birth, and adopted by three different families. Their feel-good story became a global sensation, bringing the 19-year-olds fame and celebrity. But the fairy-tale reunion sets in motion a series of events that unearth an unimaginable secret – and could transform our understanding of human nature. Filmmaker Tim Wardle’s acclaimed documentary is investigative journalism at its best. Shows Wed, July 25. Until recently, setting out to climb a mountain would have been considered close to lunacy. These majestic realms were places of peril, not beauty. From Tibet to Australia, Alaska to Norway, director Jennifer Peedom has fashioned an astonishing symphony of mountaineers, ice climbers, free soloists, snowboarders, and mountain bikers. Willem Dafoe provides the narration. Shows Tuesday, July 31. Forty years after the death of Elvis Presley, filmmaker Eugene Jarecki’s (Why We Fight) new documentary takes the King’s 1963 Rolls-Royce on a musical road trip across America. From Memphis to New York, Las Vegas, and beyond, the journey traces the rise and fall of Elvis as a metaphor for the country he left behind. Jarecki paints a visionary portrait of the current state of the American Dream and a penetrating look at how the hell we got here. A diverse cast of Americans join the journey, including Alec Baldwin, Rosanne Cash, Chuck D, Emmylou Harris, Ethan Hawke, Van Jones, Mike Myers, and Dan Rather. Shows Wed, Aug 1. THE BIRTH OF THE BEATLES Composer/producer Scott Freiman has recorded his second series of lectures on The Beatles. In the late fifties, John, Paul, George, and Ringo were just four Liverpudlian teenagers who picked up guitars (or drumsticks) and decided to play music. With no formal training and no ability to read or write music, they tried to emulate their American rock heroes. Within a few years, they would change music history and the world forever. Shows Tuesday, Aug 7. This documentary plays like a political thriller. One of the greatest threats to American democracy is the influence of untraceable corporate money on our elections and elected officials. The film takes viewers to Montana—a frontline in the fight to preserve fair elections nationwide—to follow an intrepid local journalist working to expose the real-life impacts of the U.S. Supreme Court’s Citizens United decision. This Sundance award-winning documentary is from filmmaker and Montana native Kimberly Reed. Shows Wed, Aug 8. Over the last two decades, a rise in physical attacks and anti-Semitism against Jews has been recorded in many countries across Europe. At the same time an increasingly fractured world has exposed deep political, social, and racial division, especially in France. Spiral is the story of how a cycle of fear, hatred, and violence has taken hold. Shows Wed, Aug 15. 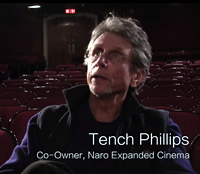 The annual competition of Hampton Roads filmmaker teams who must make a short film that is scripted, filmed, edited, and scored within the 48 hour allowed time limit. Whew! All submitted films are shown in two separate programs on Aug 14 & 16 and the winners are announced and shown on Sunday, Aug 19.